Strain Origin: White variant of PF Classic. This description covers only the white form of the PF Classic which reliably appears mixed with apparently normal mushrooms in culture. 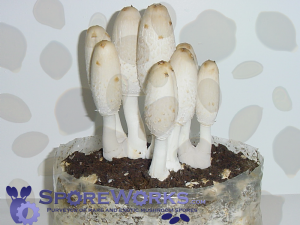 Spores from the normal colored mushrooms are offered here and are guaranteed to carry the albino trait. 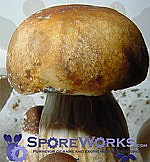 Cap: 50-75+ mm in diameter, broadly convex to plane at maturity. Surface dry and white easily bruising bluish green. Gills: Attachment adnate to adnexed. White in young fruit bodies becoming blue at maturity. Spores: colorless, subellipsoid on 4-spored basidia. 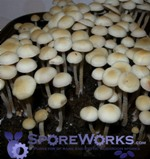 This strain is an extremely poor spore depositor. Comments: PF considered the spontaneous appearance of this white variant as a bad omen.